1 And Adam knew Eue his wife, and shee conceiued, and bare Cain, and said, I haue gotten a man from the LORD. 2 And she againe bare his brother Abel, and Abel was a keeper of sheep, but Cain was a tiller of the ground. 3 And in processe of time it came to passe, that Cain brought of the fruite of the ground, an offering vnto the LORD. 4 And Abel, he also brought of the firstlings of his flocke, and of the fat thereof: and the LORD had respect vnto Abel, and to his offering. 5 But vnto Cain, and to his offring he had not respect: and Cain was very wroth, and his countenance fell. 6 And the LORD said vnto Cain, Why art thou wroth? And why is thy countenance fallen? 7 If thou doe well, shalt thou not be accepted? and if thou doest not well, sinne lieth at the doore: And vnto thee shall be his desire, and thou shalt rule ouer him. 8 And Cain talked with Abel his brother: and it came to passe when they were in the field, that Cain rose vp against Abel his brother, and slew him. 9 ¶ And the LORD said vnto Cain, Where is Abel thy brother? And hee said, I know not: Am I my brothers keeper? 10 And he said, What hast thou done? the voyce of thy brothers blood cryeth vnto me, from the ground. 11 And now art thou cursed from the earth, which hath opened her mouth to receiue thy brothers blood from thy hand. 12 When thou tillest the ground, it shall not henceforth yeeld vnto thee her strength: A fugitiue and a vagabond shalt thou be in the earth. 13 And Cain said vnto the LORD, My punishment is greater, then I can beare. 14 Behold, thou hast driuen me out this day from the face of the earth, and from thy face shall I be hid, and I shall be a fugitiue, and a vagabond in the earth: and it shall come to passe, that euery one that findeth me, shall slay me. 15 And the LORD said vnto him, Therefore whosoeuer slayeth Cain, vengeance shalbe taken on him seuen fold. And the LORD set a marke vpon Cain, lest any finding him, should kill him. 17 And Cain knew his wife, and she conceiued and bare Enoch, and hee builded a City, and called the name of the City, after the name of his sonne, Enoch. 18 And vnto Enoch was borne Irad: and Irad begate Mehuiael, and Mehuiael begate Methusael, and Methusael begate Lamech. 19 ¶ And Lamech tooke vnto him two wiues: the name of the one was Adah, and the name of the other Zillah. 20 And Adah bare Iabal: he was the father of such as dwell in tents, and of such as haue cattell. 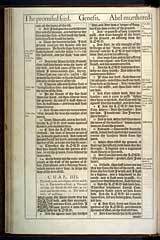 21 And his brothers name was Iubal: hee was the father of all such as handle the harpe and organ. 22 And Zillah, she also bare Tubal-Cain, an instructer of euery artificer in brasse and iron: and the sister of Tubal-Cain was Naamah. 23 And Lamech sayd vnto his wiues, Adah and Zillah, Heare my voyce, yee wiues of Lamech, hearken vnto my speech: for I haue slaine a man to my wounding, and a yong man to my hurt. 24 If Cain shall bee auenged seuen fold, truely Lamech seuenty and seuen folde. 25 ¶ And Adam knew his wife againe, and she bare a sonne, & called his name Seth: For God, said she, hath appointed mee another seed in stead of Abel, whom Cain slew. 26 And to Seth, to him also there was borne a sonne, and he called his name Enos: then began men to call vpon the Name of the LORD. The birth, employment, and religion of Cain and Abel. (1-7) Cain murders Abel, The curse of Cain. 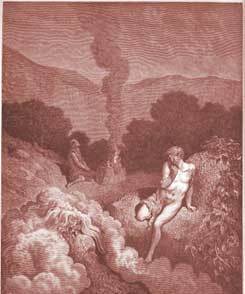 (8-15) The conduct of Cain, His family. (16-18) Lamech and his wives, The skill of Cain's descendants. (19-24) The birth of another son and grandson of Adam. (25,26)1-7 When Cain was born, Eve said, I have gotten a man from the Lord. Perhaps she thought that this was the promised seed. If so, she was wofully disappointed. Abel signifies vanity: when she thought she had the promised seed in Cain, whose name signifies possession, she was so taken up with him that another son was as vanity to her. Observe, each son had a calling. It is the will of God for every one to have something to do in this world. Parents ought to bring up their children to work. Give them a Bible and a calling, said good Mr. Dod, and God be with them. We may believe that God commanded Adam, after the fall, to shed the blood of innocent animals, and after their death to burn part or the whole of their bodies by fire. Thus that punishment which sinners deserve, even the death of the body, and the wrath of God, of which fire is a well-known emblem, and also the sufferings of Christ, were prefigured. Observe that the religious worship of God is no new invention. It was from the beginning; it is the good old way, #Jer 6:16|. The offerings of Cain and Abel were different. Cain showed a proud, unbelieving heart. Therefore he and his offering were rejected. Abel came as a sinner, and according to God's appointment, by his sacrifice expressing humility, sincerity, and believing obedience. Thus, seeking the benefit of the new covenant of mercy, through the promised Seed, his sacrifice had a token that God accepted it. Abel offered in faith, and Cain did not, #Heb 11:4|. In all ages there have been two sorts of worshippers, such as Cain and Abel; namely, proud, hardened despisers of the gospel method of salvation, who attempt to please God in ways of their own devising; and humble believers, who draw near to him in the way he has revealed. Cain indulged malignant anger against Abel. He harboured an evil spirit of discontent and rebellion against God. God notices all our sinful passions and discontents. There is not an angry, envious, or fretful look, that escapes his observing eye. The Lord reasoned with this rebellious man; if he came in the right way, he should be accepted. Some understand this as an intimation of mercy. "If thou doest not well, sin, that is, the sin-offering, lies at the door, and thou mayest take the benefit of it." The same word signifies sin, and a sacrifice for sin. "Though thou hast not done well, yet do not despair; the remedy is at hand." Christ, the great sin-offering, is said to stand at the door, #Re 3:20|. And those well deserve to perish in their sins, that will not go to the door to ask for the benefit of this sin-offering. God's acceptance of Abel's offering did not change the birthright, and make it his; why then should Cain be so angry? Sinful heats and disquiets vanish before a strict and fair inquiry into the cause. 8-15 Malice in the heart ends in murder by the hands. Cain slew Abel, his own brother, his own mother's son, whom he ought to have loved; his younger brother, whom he ought to have protected; a good brother, who had never done him any wrong. What fatal effects were these of our first parents' sin, and how must their hearts have been filled with anguish! Observe the pride, unbelief, and impenitence of Cain. He denies the crime, as if he could conceal it from God. He tries to cover a deliberate murder with a deliberate lie. Murder is a crying sin. Blood calls for blood, the blood of the murdered for the blood of the murderer. Who knows the extent and weight of a Divine curse, how far it reaches, how deep it pierces? Only in Christ are believers saved from it, and inherit the blessing. Cain was cursed from the earth. He found his punishment there where he chose his portion, and set his heart. Every creature is to us what God makes it, a comfort or a cross, a blessing or a curse. The wickedness of the wicked brings a curse upon all they do, and all they have. Cain complains not of his sin, but of his punishment. It shows great hardness of heart to be more concerned about our sufferings than our sins. God has wise and holy ends in prolonging the lives even of very wicked men. It is in vain to inquire what was the mark set upon Cain. It was doubtless known, both as a brand of infamy on Cain, and a token from God that they should not kill him. Abel, being dead, yet speaketh. He tells the heinous guilt of murder, and warns us to stifle the first risings of wrath, and teaches us that persecution must be expected by the righteous. Also, that there is a future state, and an eternal recompence to be enjoyed, through faith in Christ and his atoning sacrifice. And he tells us the excellency of faith in the atoning sacrifice and blood of the Lamb of God. Cain slew his brother, because his own works were evil, and his brother's righteous, #1Jo 3:12|. In consequence of the enmity put between the Seed of the woman and the seed of the serpent, the war broke out, which has been waged ever since. In this war we are all concerned, none are neuter; our Captain has declared, He that is not with me is against me. Let us decidedly, yet in meekness, support the cause of truth and righteousness against Satan. 16-18 Cain cast off all fear of God, and attended no more on God's ordinances. Hypocritical professors, who dissemble and trifle with God, are justly left to themselves to do something grossly scandalous. So they throw off that form of godliness to which they have been a reproach, and of which they deny the power. Cain went out from the presence of the Lord, and we never find that he came into it again, to his comfort. The land Cain dwelt in was called the land of Nod, which means, 'shaking,' or 'trembling,' and so shows the restlessness and uneasiness of his own spirit, or 'the land of a vagabond:' they that depart from God cannot find rest any where else. Those on earth who looked for the heavenly city, chose to dwell in tabernacles or tents; but Cain, as not minding that city, built one on earth. Thus all who are cursed of God seek their settlement and satisfaction here below. 19-24 One of Cain's wicked race is the first recorded, as having broken the law of marriage. Hitherto, one man had but one wife at a time; but Lamech took two. Wordly things, are the only things that carnal, wicked people set their hearts upon, and are most clever and industrious about. So it was with this race of Cain. Here was a father of shepherds, and a father of musicians, but not a father of the faithful. Here is one to teach about brass and iron, but none to teach the good knowledge of the Lord: here are devices how to be rich, and how to be mighty, and how to be merry; but nothing of God, of his fear and service. Present things fill the heads of most. Lamech had enemies, whom he had provoked. He draws a comparison betwixt himself and his ancestor Cain; and flatters himself that he is much less criminal. He seems to abuse the patience of God in sparing Cain, into an encouragement to expect that he may sin unpunished. 25,26 Our first parents were comforted in their affliction by the birth of a son, whom they called Seth, that is, 'set,' 'settled,' or 'placed;' in his seed mankind should continue to the end of time, and from him the Messiah should descend. While Cain, the head of the apostacy, is made a wanderer, Seth, from whom the true church was to come, is one fixed. In Christ and his church is the only true settlement. Seth walked in the steps of his martyred brother Abel; he was a partaker of like precious faith in the righteousness of our God and Saviour Jesus Christ, and so became a fresh witness of the grace and influence of God the Holy Spirit. God gave Adam and Eve to see the revival of religion in their family. The worshippers of God began to do more in religion; some, by an open profession of true religion, protested against the wickedness of the world around. The worse others are, the better we should be, and the more zealous. Then began the distinction between professors and profane, which has been kept up ever since, and will be, while the world stands. All we really need to know is this. When Cain begot children with his [mystery] wife the children were wicked because Cain was wicked. The wickedness is whatâ€™s more/really important. Knowing who his wife was isnâ€™t really all that important. Besides for all we know she was probably wicked herself. I will admit the nagging question(s) wouldn't go away, but at the same time donâ€™t question Godâ€™s Word. Brenda, Your guess is good as mine, sometimes God doesn't tell everything just the important things. The devil is not a serpent, the devil (satin) was Lucifer cast out of heaven for sinning. The devil used this serpent because was the most beautiful and smartest of the animals as he uses people today. The devil rather use beautiful and smart then the less attractive to get his way to deceive and destroy.